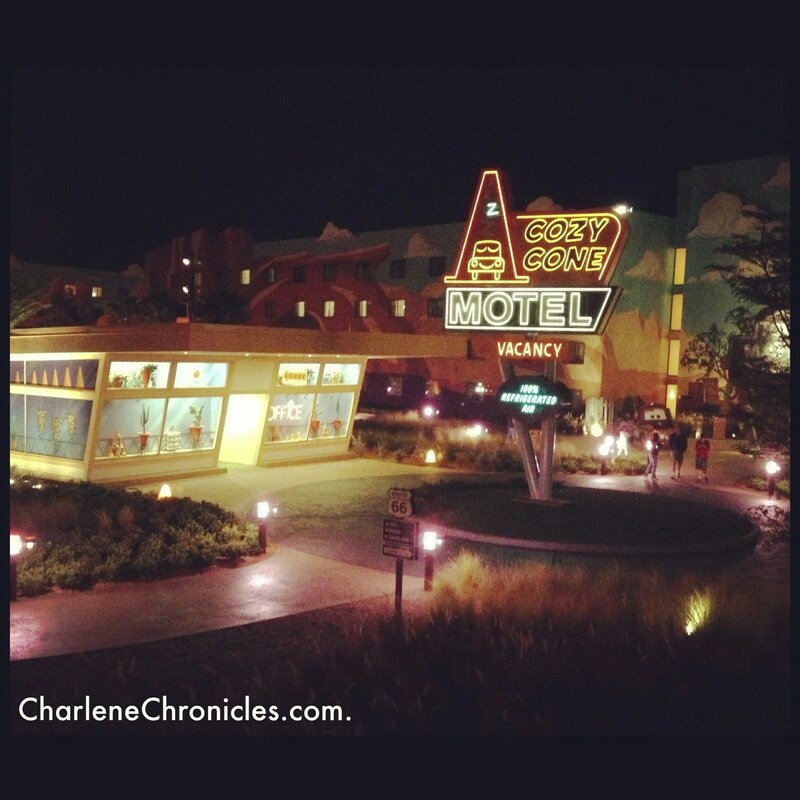 If you would like to read my Art of Animation Resort review, you can find it here. 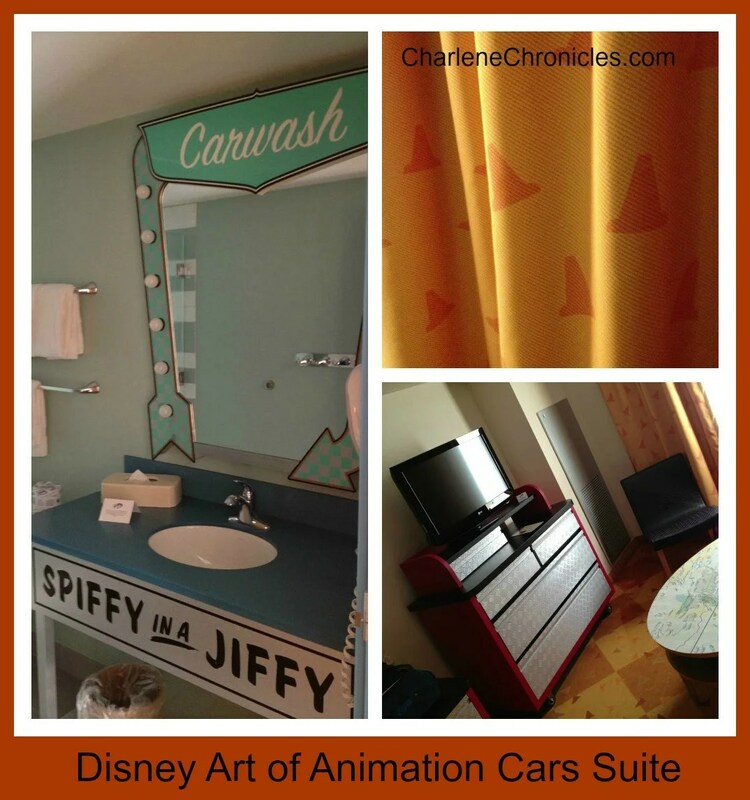 This post focuses on our stay at the Art of Animation Cars Suite. We stayed from Sunday afternoon to Saturday morning. In the room were my five month old, my three-ish year old, my parents and my husband (so four adults and two kids.) Despite the fact that we had more adults than kids, we had enough room to feel like we were not on top of each other. Here is a nighttime picture outside the window of our room. My husband and I stayed in the separate bedroom with the queen size bed with our five month old in a Disney-provided pack and play. We just asked for it when we checked-in and it was at our door within minutes of getting to our room. My parents slept on the pull out couch. I felt bad, but they said it was a very comfortable bed and they liked the fact that there was also a TV. It was also tucked away a bit, and the angle of the TV was such that when my toddler slept in the Murphy Bed, he wasn’t disturbed by it. 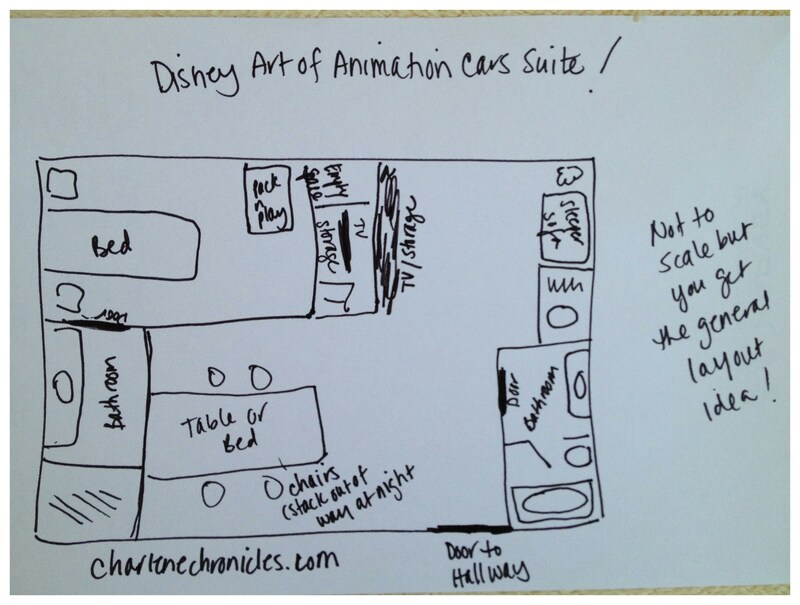 Here is a Cars Suite diagram or a Cars Suite layout, if you prefer. We loved the fold out couch and the Murphy bed (to see a video of it in action, click here). In the morning, everything was tucked out of place. The Murphy bed was especially cute, because when the bed was not in use, it was a table to have our meals or a place for our son to play with the iPad during downtimes. If the baby was older, we probably would have had my parents say in the bedroom so they could shut the door and have some kid-free space. Then my husband and I would have slept on the pullout sofa with the two kids on the Murphy bed. But we didn’t want the baby to wake up everyone at night since she still wakes up (a lot), so that is why we made the sleeping arrangements that way. We loved the décor: so Disney. To keep with the Car-theme, the art, the curtains, the lamps, the rug, the mirrors, and even the couch, which looks like the back seat of a hot rod, all had a nod to roads and roadsters. There was plenty of storage in dressers that looked like tool boxes. The only two suggestions we would make would be to have the ceiling lights be on a dimmer switch. We usually were stumbling around in the dark because to turn on the light would make it seem like daylight and wake the kids. It would also have been neat if there was a curtain, on a rod, that could separate the two open sleeping areas in the main space. As for the bathrooms, there were two full size bathrooms that were inspired by a car wash – one with a bathtub where we could bath the kids at night. The bathroom in the main area also had a separate sink area so someone could be brushing their teeth while another person was taking a shower. There was plenty of storage for our toiletries, but the storage was underneath the sinks. It was open concept, but with young children, we had to make sure concerning items were out of reach. There was also a mini-kitchen with a microwave, a fridge, a sink and countertops. It was great for families with babies. We could keep the baby’s bottles in the fridge, heat them in the microwave, and wash the bottles in the sink and let them dry on the countertop. We also wanted to cut down on our food budget. We did not get a Disney Dining Plan so our dinner in the cafeteria on the first night cost us $60 for four adults and one child. We knew that we would blow our budget pretty quickly. So my Mom and I took at cab from the front entrance to the Super Walmart located just a few miles from the Art of Animation resort. It is also open 24 hours and has great, authentic Disney souvenirs if you are looking to save money. 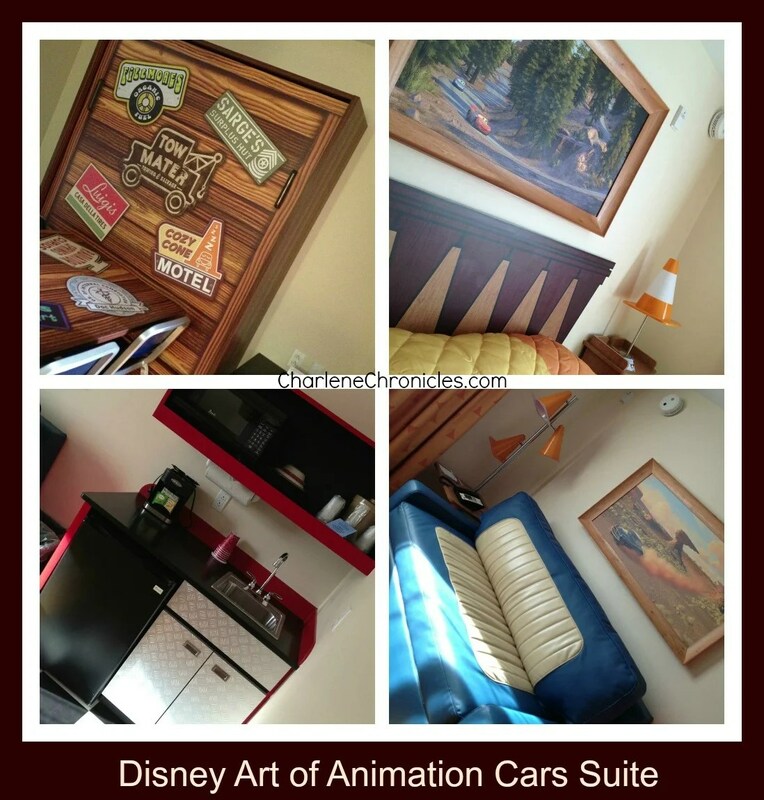 Since the Art of Animation resort is located near the entrance of the Walt Disney property (just outside of the Wide World of Sports), the cost was $40 round trip. A Disney cast member got us a cab immediately, and we were at the Walmart within 10 minutes. We purchased water, soda, fruit, wine, breakfast bars, bread, meat, cheese, chips, cookies, juice, yogurt and milk for five people for the remainder of our stay. The total came to about $150. Then we went to the cab stand outside the Walmart and the cab driver loaded out groceries into the cab and we headed back to the resort where a Disney Cast member put our groceries on a luggage cart and delivered it to our room. With groceries costing $150, the cab costing $40 and with the various tips, the total cost was $200. We knew dinner alone for the remaining five nights of our stay would cost us $300 (5x$60) and that didn’t include any other meals. Now we had breakfast, lunch, snacks and a couple of dinners too for $200. The resort was a blast to be around. Our toddler LOVED the Car section that we stayed in. Despite the fact that he actually has never seen this Disney movie, he loves cars and trucks so it was a perfect fit. He had to greet each car every morning and every night, and loved taking pictures next to each one. Leave it to Disney to position the cars perfectly. When you take a photo, you wouldn’t know a hotel was right behind it. All in all the Disney Cast was great and I loved all the little touches. In addition to the ones I mentioned above, when we were given directions to our room upon check-in, the front-desk told us to take “Route 66”. If you are staying in the Little Mermaid section, for example, they will refer to you as a Mermaid/Merman, and the kids as Guppies. Of course, look for the hidden Mickeys! It is a great resort to consider when traveling to Disney, but is especially fantastic if you are looking for an affordable family suite! (As of 01/13, the suite rate is about $250 a night.) There is so much to see and do at the Resort if you decided to forego the parks on day. With the walking paths, the various decorations, a game room, pools, splash pad, slides, ample sized cafeteria and affordable laundry facilities, we will definitely be staying here again! Have any questions about our stay here? Let me know in the comments, or contact me via my contact form, and I will do my best to answer! And check out my other Disney related posts! Disclosure: I attended the grand opening of New Fantasyland as a member of the media and received a complimentary two night stay at the Art of Animation Resort. Wooohooo. We’ll be there in just under two weeks. 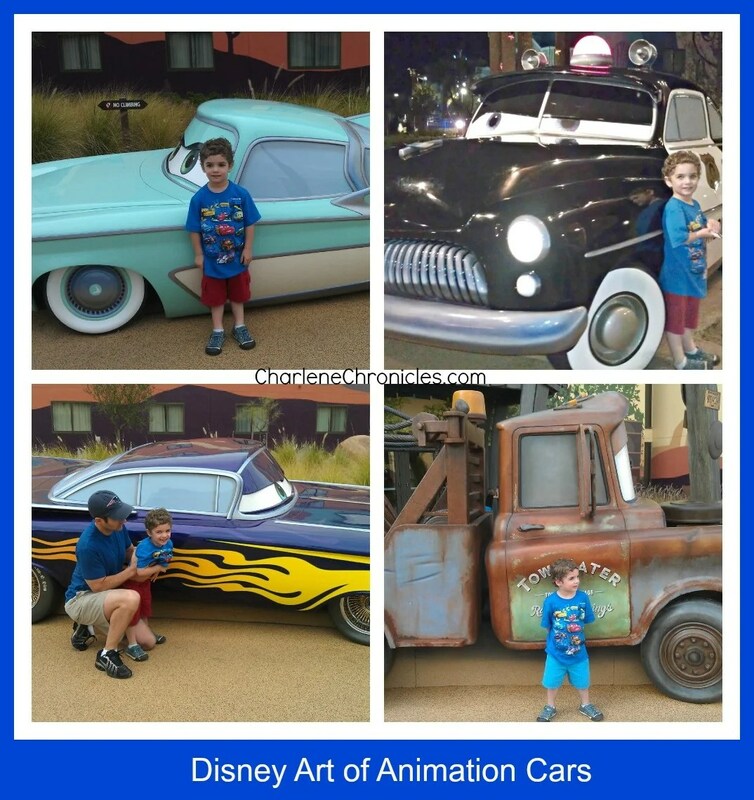 Your review makes me even happier we chose to stay at The Art of Animation!